I wanted to make something to go with my recently designed wine bottle gift bag and came up with a Wine Glass Slip-on Coaster with a bit of a design twist. Many of us have used those cute little wine glass charms at parties, so we can keep track of our glass, right? So this made me wonder, “How can I incorporate that idea into a slip-on wine glass coaster?” Here’s what I came up with. I rather like it. I hope you do too! 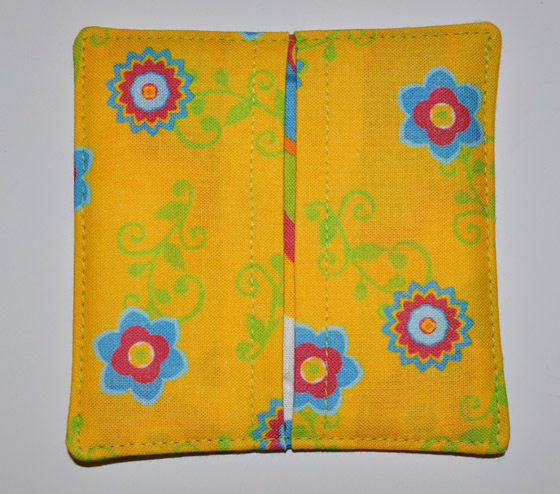 I made a set of 4 slip-on wine glass coasters using fabrics from my Retro Flower Garden original fabric collection available exclusively at my Spoonflower Shop. Of course, you can make a set of 6 or 8 or… well, you get the point. 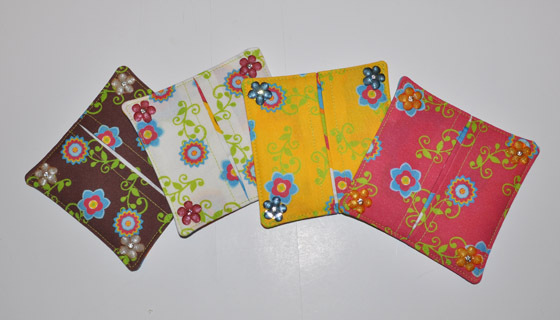 The idea is to use fabrics that coordinate and look fantastic together, but keep each coaster unique. I added some cute embellishments on each corner as my charms. Each set of charms is a different color too, which helps with glass identification, plus it just adds a nice finishing touch. Another note, I cut my fabric pieces using a rotary cutter and mat. 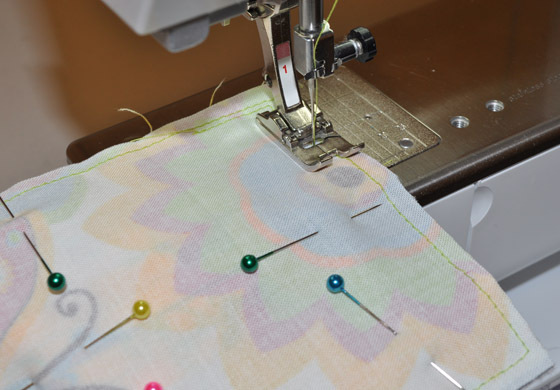 You don’t have to do this, but if you are familiar with using these tools and have them available, it makes cutting your fabric fast and easy. Otherwise, I would suggest drawing templates from poster board or card stock and using those to trace around onto your fabric to cut your squares and rectangles as needed. 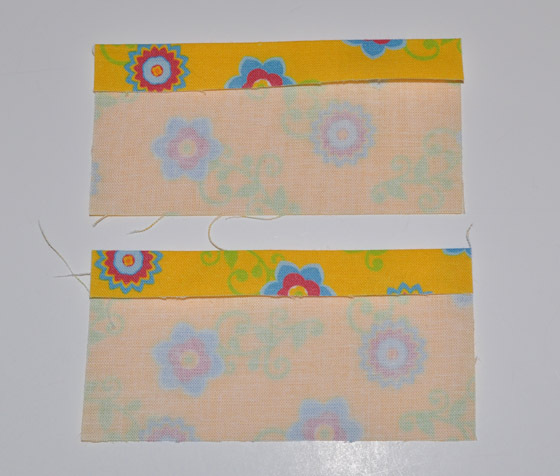 Once you have your fabric pieces cut, start with your two top rectangle pieces. 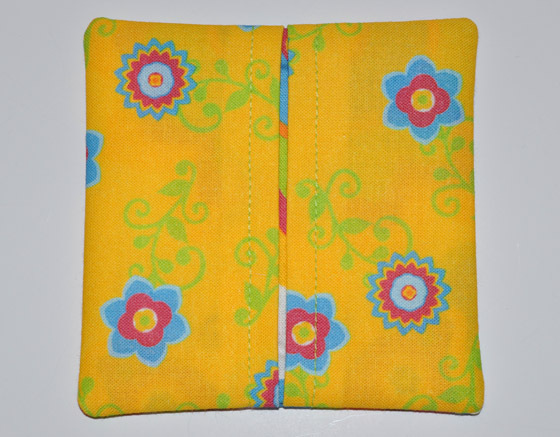 Fold in 1/2″ to the wrong side on one long edge on each piece. Press in place. 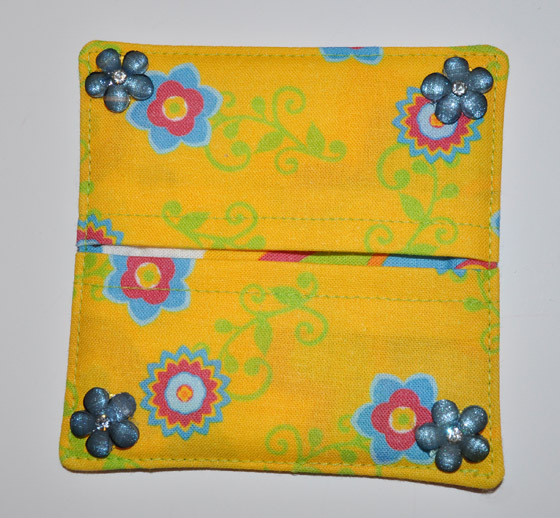 Top stitch 1/4″ from folded edge on each. Place two top sections on top of inside fabric square-all are facing RIGHT SIDE UP. Baste together 1/8″ from edge. 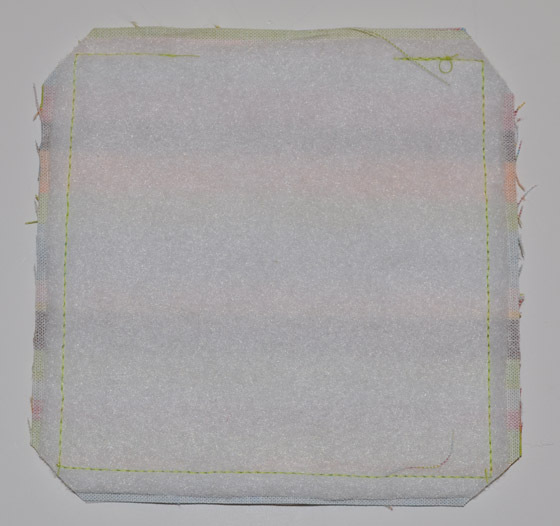 Assemble layers in this order: top section you just basted together RIGHT SIDE UP, Bottom square next RIGHT SIDE DOWN, finally Batting square on top of that so the batting square is on the wrong side of the bottom of fabric. 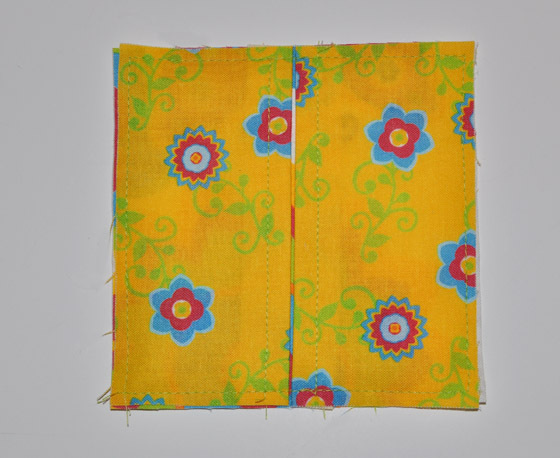 Pin together and stitch around using a 1/4″ seam. Reduce seam bulk by trimming the batting layer seam edge off 1/8″. Cut corners diagonally. Turn coaster right side out through 2″ side opening. Turn side opening edges in to match seam line and press. 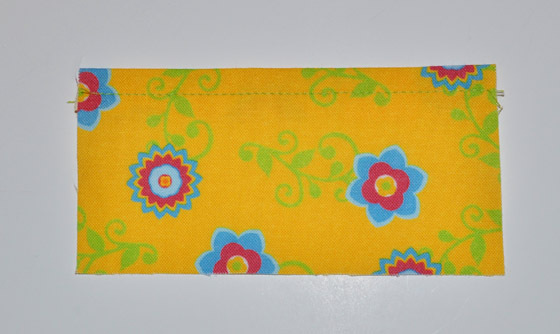 Topstitch 1/8″ from edge all the way around. 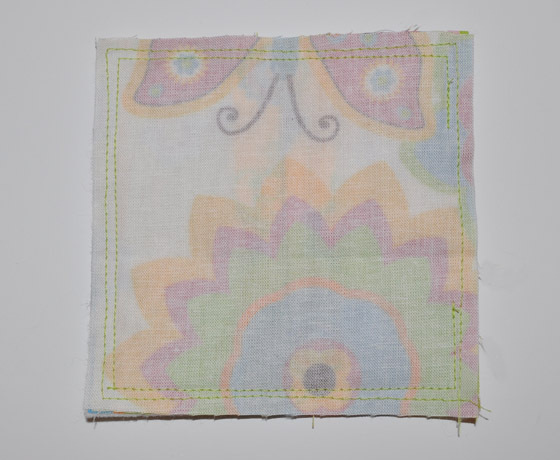 Glue charm embellishments on each corner and let dry thoroughly before use. Make a set of these as a hostess gift, a bunco door prize, Christmas gift basket goodie or just a unique gift for a friend. 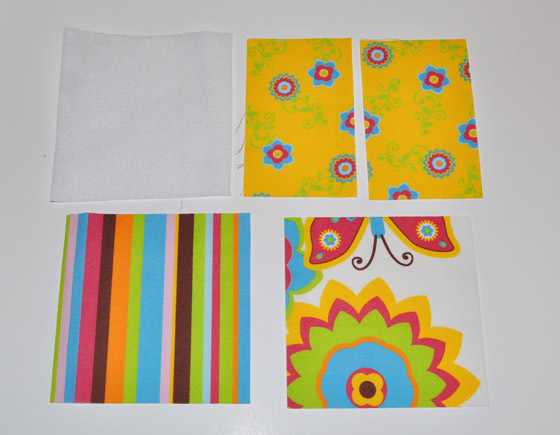 If you like the fabrics I used to make my coasters, stop by my Spoonflower Shop to purchase any fabrics in my collections. Check out my Wine Bottle Gift Bag Tutorial for a charming wine bottle bag to go with your slip-on coasters! 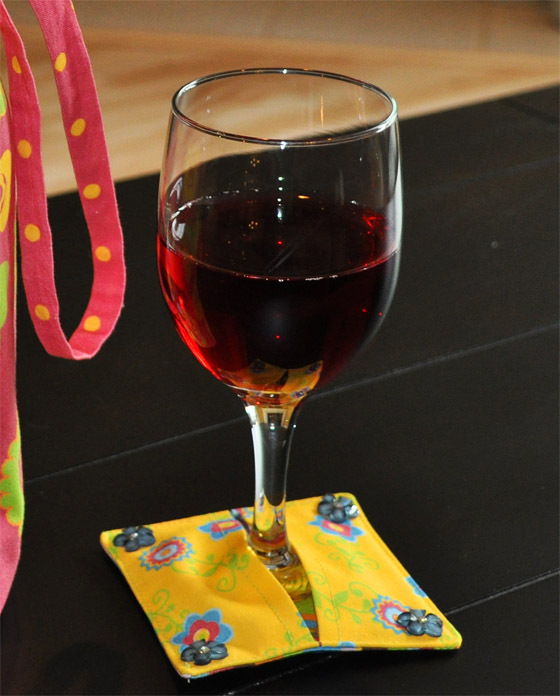 This entry was posted in Free Patterns, Home Decorations, Sewing, Sewing Patterns, Tutorials and tagged coaster sewing pattern, coaster sewing tutorial, coasters, free wine glass coaster pattern, free wine glass coaster tutorial, slip on glass coaster sewing pattern, slip on wine glass coaster, slip on wine glass coaster tutorial, wine glass coaster. Bookmark the permalink. A coworker will be retiring soon and she loves wine and cheese on Friday nights. I will make this and a wine bag to go with the bottle of wine she will be given. This is perfect and she will love it! Incredibly cute! What a nice idea for a gift. Thank you so much for sharing.